Saudi Arabia has announced that contractor India-based Shapoorji Pallonji Mideast has completed construction of Dammam’s tallest skyscraper. UAE firm Dewan Architects carried out the supervision and design works for the 64,000 square-metre tower, Construction Week Online reported, citing officials from Saudi Arabia as saying. “The tower’s façade and slanting volumes make for arresting lines and configurations within the interior, creating distinctive and dynamic office spaces on every floor, which allows the building to cater to numerous companies with varying spatial needs,” Dewan Architects’ executive director Ammar Al Assam said in a statement. 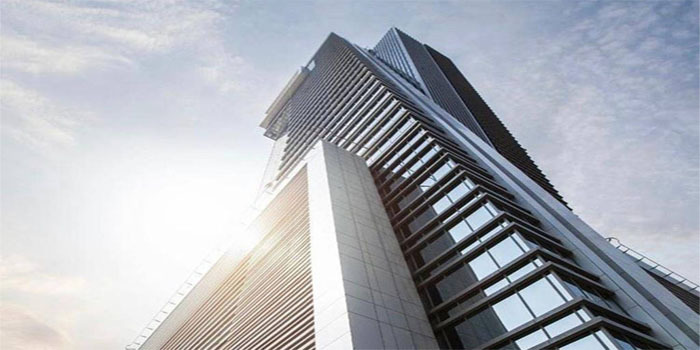 The newly-built skyscraper, which will be the new headquarters for wholesale distributor Al Abdul Karim Holding (AKH), comprises 37 storeys, access control, Closed Circuit Television (CCTV), high-quality telecommunication equipment, and an energy-saving building management system. The Dammam city tower known as AKH Tower, will house both AKH and other companies, the firm said.